Most Compiere customers work with Consona and a Compiere Authorized Partner to implement customized business solutions software that creates maximum long-term business value at a reasonable cost. Compiere Authorized Partners have skills ranging from solution design, implementation, system integration and support. And, some partners specialize in specific industries or geographies. Compiere partners are located in over 25 countries. Use our Partner locator to find a partner to assist you in the evaluation, selection and deployment of customized Compiere business solutions software. 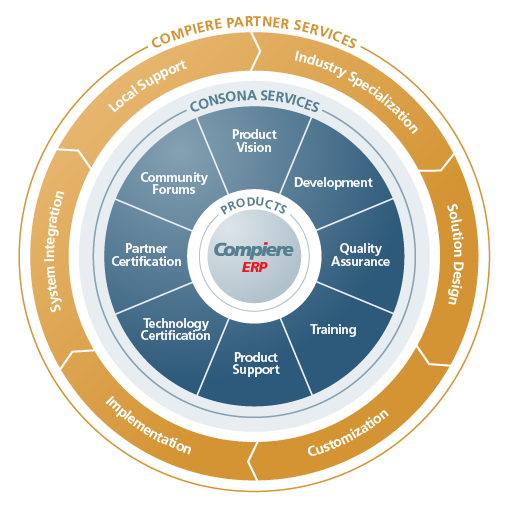 Consona is recruiting System Integrators and Value-Added Resellers with ERP implementation expertise to join the Compiere Partner Network. Independent Software Vendors (ISV) seeking to embed the Compiere ERP platform in their own branded product line are invited to join the Powered by Compiere program.